HOBOKEN, N.J. -- Federal investigators are trying to determine what happened before a New Jersey commuter train barreled through a station and crashed into a barrier, causing a young mother to be killed by falling debris and injuring more than 100 others. Investigators from the National Transportation Safety Board will be looking to determine how fast the train was going when it crashed at the busy Hoboken station Thursday morning. Investigators recovered an event recorded from the locomotive Thursday night and will be examining it Friday, NTSB vice chairwoman T. Bella Dinh-Zarr said Friday morning on ABC's "Good Morning America." The device contains information on the train's speed and braking. More than 100,000 people use New Jersey Transit to commute from New Jersey to New York City each day. The NJ Transit portion of the Hoboken station remained closed on Friday, slowing the morning commute for those making connections there. Dozens were injured and one killed in a fatal train crash in Hoboken, New Jersey on Thursday morning. 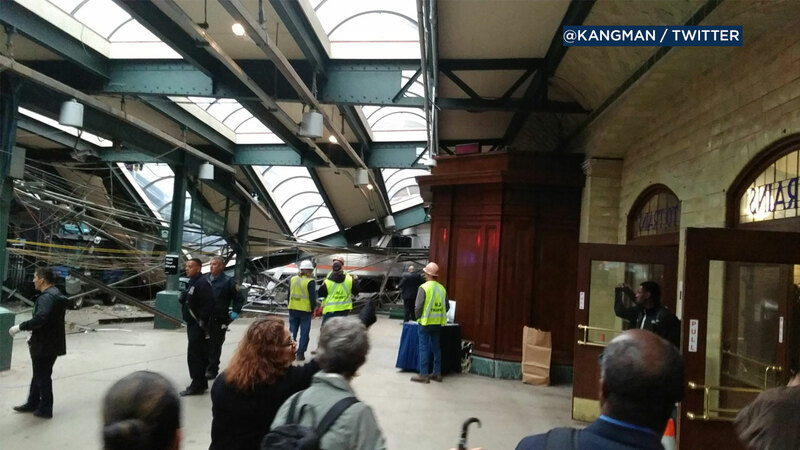 Click here for the latest on the Hoboken train crash.